HR: West Michigan: Anthony Pereira (1st, 0 on base in sixth inning). 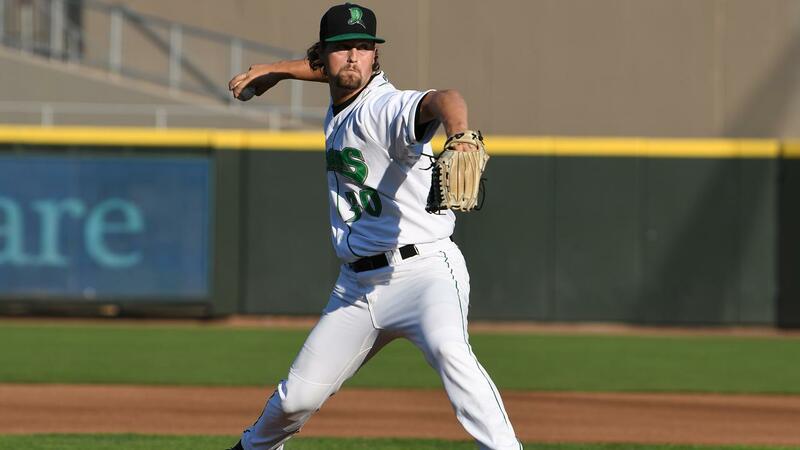 Dayton, Ohio-The Dayton Dragons closed out their home season at Fifth Third Field with a come-from-behind 7-5 victory over the West Michigan Whitecaps on Friday night. A crowd of 8,275 was in attendance, bringing the Dragons final attendance total for the year to 550,725, best among all teams in Minor League Baseball below the Triple-A level. Jeter Downs led a 10-hit Dayton attack with two hits and two runs batted in. The Dragons took an early 3-0 lead, saw West Michigan battle back to go ahead 4-3, before the Dragons were able to bounce back and fight off the Whitecaps for the win. The Dragons took a 2-0 lead in the first inning, getting a run-scoring single from Jeter Downs and a sacrifice fly by Andy Sugilio to start the scoring. The Dragons added another run in the second on an RBI single by J.D. Williams to make it 3-0. West Michigan scored one run in the third inning and three more in the fourth to take a 4-3 lead. But the Dragons answered with a run in the bottom of the fourth to tie the game as Williams drove in Leandro Santana from third base with a sacrifice fly. The Dragons briefly took the lead in the fifth on Santana's run-scoring single that brought Hendrik Clementina in from second base to make it 5-4. West Michigan's Anthony Pereira belted a solo home run in the top of the sixth to tie the game at 5-5. The Dragons regained the lead in the sixth, scoring twice. The first run came in on Jonathan India's RBI grounder to third that was mishandled for an error. Downs drove in another run with a single to make it 7-5. Dayton starting pitcher Patrick McGuff lasted three and one-third innings, allowing four runs on eight hits with two walks and three strikeouts. Cory Thompson (6-6) replaced McGuff and worked two and two-thirds innings, allowing one run on two hits with three strikeouts to earn the win. Miguel Aguilar replaced Thompson to start the seventh and tossed two scoreless innings, allowing one hit with two strikeouts. Aneurys Zabala pitched a perfect ninth inning for his fourth save. Along with Downs, Leandro Santana added two hits to the Dragons attack. Williams had one hit and two runs batted in. Up Next: The Dragons (26-41, 57-78) travel to Bowling Green, Kentucky to battle the Bowling Green Hots (41-26, 88-48) in the first game of a season-ending three-game series on Saturday night at 7:35 (EDT). Jared Solomon (2-5, 3.74) will start for Dayton.